U.S. President Donald Trump and Russian President Vladimir Putin will meet next week in Finland for their first bilateral summit (though they have met in less formal settings on other occasions). Issues on the table could include the NATO military alliance, U.S. sanctions against Russia, the conflict in Syria and the status of Ukraine. 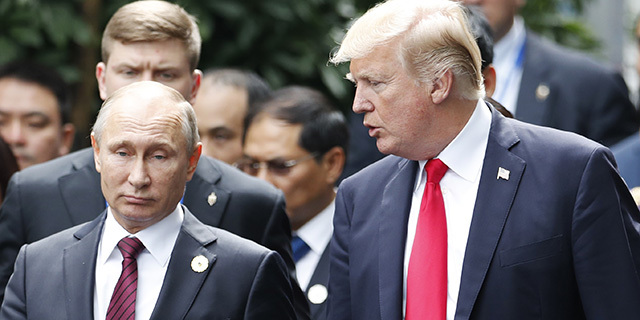 Ahead of the summit, here are key findings about Trump and Putin – and the countries they lead – from Pew Research Center surveys. 1Most Americans (68%) express an unfavorable opinion of Putin, but Russians have a relatively positive view of Trump. Just 16% of Americans saw Putin favorably, according to a survey conducted in early 2018, before Putin’s re-election. A quarter of Republicans and Republican-leaning independents (25%) said they had a favorable view of Putin, compared with just 9% of Democrats and Democratic leaners. These views have changed little since last year. 2Globally, there is low confidence in Putin and Trump on international affairs. A global median of 26% said they had confidence in the Russian leader to do the right thing internationally, while six-in-ten (60%) expressed no confidence, according to a spring 2017 survey. Trump was rated even more negatively: A global median of 74% said they had no confidence in the U.S. president’s global leadership, while 22% expressed confidence. 3Russians see rising global influence and international respect for their country. 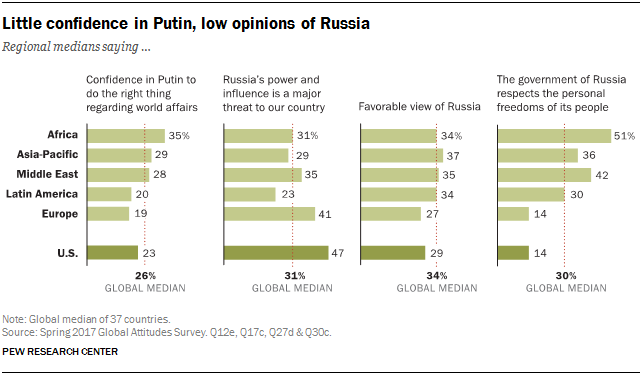 Despite low global confidence in Putin on foreign affairs, most Russians said in the spring 2017 survey that their country’s global influence has risen. Roughly six-in-ten (59%) said Russia now plays a more important role in the world than it did a decade ago. About two-in-ten said Russia’s influence has not changed (21%), while 17% said Russia is less important than a decade earlier. Although the prevailing view among Russians is that their country should be more respected than it is, the share who believe their country gets the global respect it deserves more than doubled from 2012 (16%) to 2017 (34%). 4 Many Americans say Russia’s power and influence are a major threat to the U.S. While Russians see greater global influence for their country, around half of Americans (52%) said in an October 2017 survey that Russia’s “power and influence” constitute a major threat to U.S. well-being, compared with 38% who said Russian power is a minor threat and 9% who said it is not a threat. These views varied substantially by party. 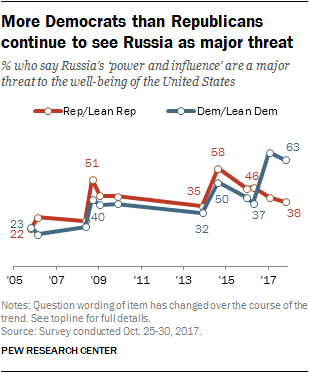 Democrats and Democratic-leaning independents were far more likely than Republicans and Republican leaners to say Russia’s power and influence are a major threat (63% vs. 38%). For many years, Republicans and Democrats generally shared views on Russia’s threat level, but partisan differences increased sharply after the 2016 U.S. presidential election. Across 37 countries, a median of 31% said Russia’s power and influence are a major threat, according to a spring 2017 survey. Fears of Russia’s influence were most acute in Poland (65%). Meanwhile, a similar global median (35%) said America’s power and influence pose a major threat. Concern about U.S. power was greatest in Turkey (72%). 5Russians tend to view NATO as a threat, and they are split over their country’s involvement in Syria. Most Russians saw NATO as either a major threat (41%) or a minor threat (39%) to their country in a survey last year. Just 16% said the trans-Atlantic alliance is not a threat at all. However, the share that saw NATO as a major threat declined from 50% in 2015. On Syria, a plurality (46%) of Russians said in the same survey that they wanted their country’s military involvement there to stay the same. Around a third (34%) preferred that Russia curtail its involvement in the Syria conflict and just 11% wanted to see Russia’s military become more engaged. When asked what Russia’s top priorities should be in Syria, most favored limiting civilian casualties (72%) and defeating extremist groups (64%). 6America’s edge over Russia in terms of global popularity has shrunk. While Russia was still viewed far less favorably than either the U.S. or China last year, a sharp decline in America’s favorability improved Russia’s standing relative to the U.S. Overall, a median of 50% across the 33 nations surveyed had a positive image of the U.S. in 2017 versus 35% who viewed Russia favorably. In previous years, 64% across these same nations had a favorable view of the U.S. compared with a median of 28% favorability for Russia.